Solution: Gaseous O2 in equilibrium with O2 dissolved in water at 283 K is depicted at right. (b) Which scene represents the system when the pressure of O2 is increased by half? Gaseous O2 in equilibrium with O2 dissolved in water at 283 K is depicted at right. 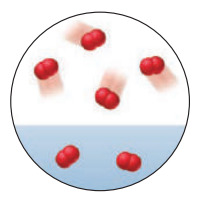 (b) Which scene represents the system when the pressure of O2 is increased by half?